Two people were killed and two others were critically injured in an overnight crash in South Nashville. NASHVILLE, Tenn. (WTVF) — A driver is facing charges after a deadly crash in South Nashville that killed two people. The incident happened just after midnight Sunday, near the intersection of Paragon Mills Road and Nolensville Pike. Officials with Metro Nashville police said 52-year-old Howard McLemore is facing two counts of vehicular homicide and one count of vehicular assault for killing his passenger and another driver in the two-car collision. 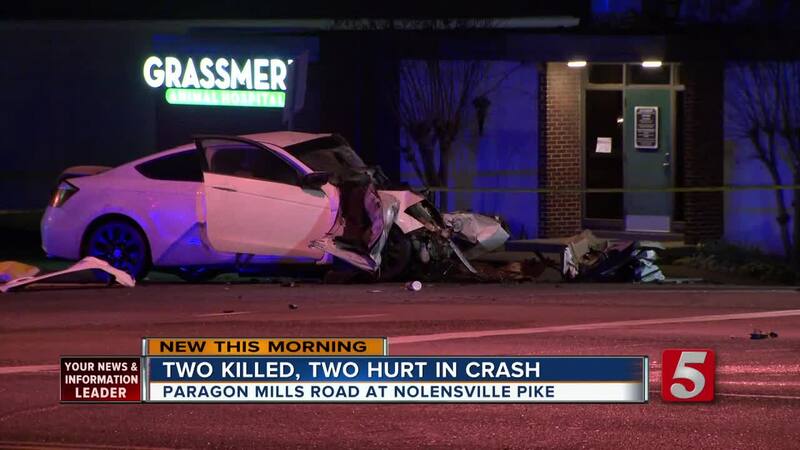 Police said McLemore, of Madison, was driving his Chevrolet Camaro the wrong way on Nolensville Pike when he collided with a 2009 Honda Civic. The crash killed the driver of the Civic, 25-year-old Joaquin Bastidas, of Nashville, and injured his passenger, 18-year-old Ibrahim Viera, of Arizona. McLemore’s passenger, 49-year-old Sandy Burns, of Nashville, was also killed. Police said McLemore was admitted to Vanderbilt University Medical Center, where an officer noted that he appeared to be impaired. A blood sample from McLemore will be analyzed for alcohol and drug content. Investigators said he will be booked on the arrest warrants when he is discharged from the hospital.